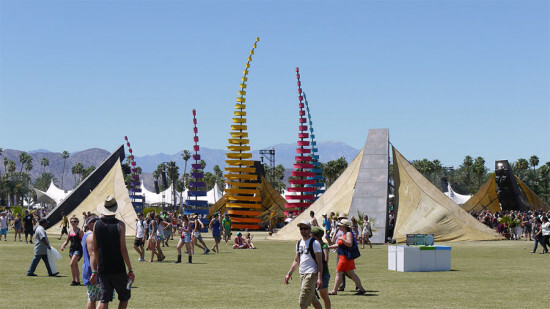 The Coachella Valley Music and Arts Festival kicked off today in the high desert outside of Los Angeles. 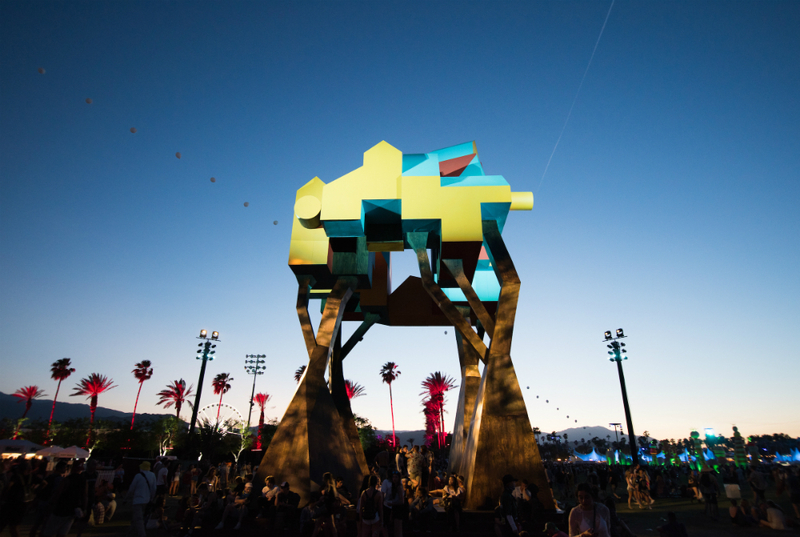 This year’s artist installations include a who's who of contemporary architects and designers bringing bright and bold installations and pavilions to the Coachella Valley’s Empire Polo Club, where the music festival takes place. The 2019 artist lineup includes Francis Kéré, Los Angeles-based Office Kovacs, concert venue designers Do LaB, and more. See below for a full run-down of the installations. AN will continue to update the post with additional photos as they become available over the weekend. Sofia Enriquez Sofia Enriquez has designed a super-scaled garden made up of six larger-than-life paisley sculptures that includes a stepped relaxation platform. 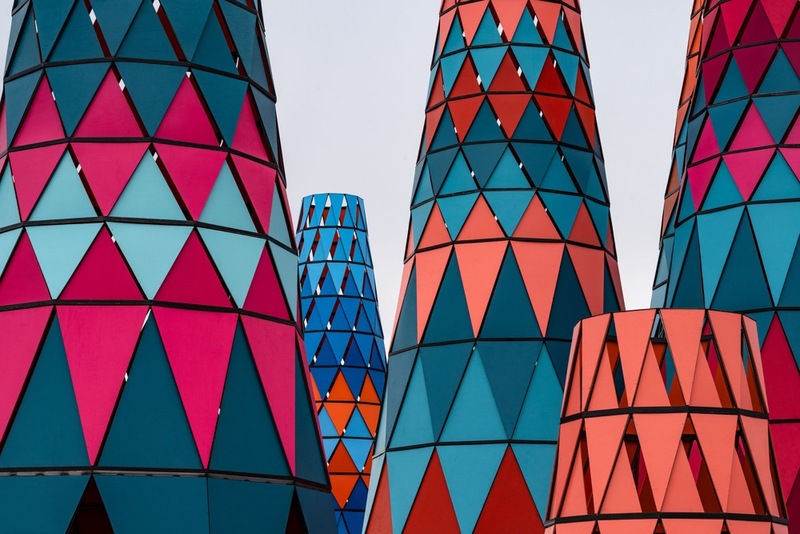 Francis Kéré Francis Kéré has crafted 12 colorful towers that reference the baobab trees that grow in the region of Burkina Faso where Kéré is from. Rising up to 60 feet in height, the colorful, conical shapes are filled with light displays and provide much-needed shade for concert goers. 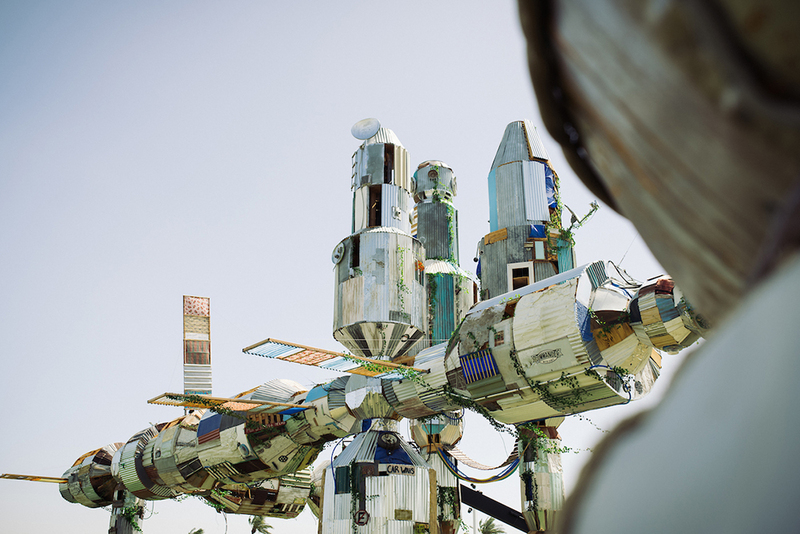 Poetic Kinetics For the 2019 run of the music festival, Poetic Kinetics has brought back its 2014 floating astronaut sculpture, Overview Effect. The battered spacesuit stands 70 feet tall and emits patterned light shows. Office Kovacs Office Kovacs’s Colossal Cacti consists of seven fluorescent cacti that range from 52 feet to 20 feet in height. The cacti are wrapped in mirrored spines that reflect sunlight and sit on a platform designed to reference the colors of Frank Stella’s Multicolored Squares. Debo Vabo Dedo Vabo’s Hazardous Interstellar Professional Operations is made up of a 72-foot-diameter base loaded with six performance spaces that highlight the trials and tribulations of a group of space-bound hippos. Brooklyn, New York–based studio Chiaozza (pronounced like “wowza”) designed a garden installation consisting of a series of whimsical, desert-inspired plant structures. Like some type of Martian golf course, the stucco-clad, Dr. Seuss-ian masses—tall and knobby, in some cases, bulbous and squat in others—are wrapped in Memphis Group–inspired squiggles and dots and sit atop circular bases made of astroturf. Adam Frezza of Chiaozza explained in a statement that the group wanted “to create a visual bath, something you can explore and get lost in” with their acre-sized installation. Nigerian-born, Brooklyn-based artist Olalekan Jeyifous created Crown Ether, an un-occupiable home supported by a series of angular, tree trunk-like pillars. The work, according to Jeyifous, is inspired by the artist’s longstanding interest in the intersection between public architecture and displacement, here symbolized by the tension resulting from the visual accessibility of the structure that cannot actually be occupied. Lastly, United Kingdom–based artists Joanne Tatham and Tom O’Sullivan created a massive installation that works as a visual pun for the phrase “elephant in the room” made up of large masses of faceted, brightly-patterned elephants. The 75-foot tall herd stands in a rough circle, with various exposures of each creation wrapped in a different geometric, colorful pattern. The installations will be on view through April 23. 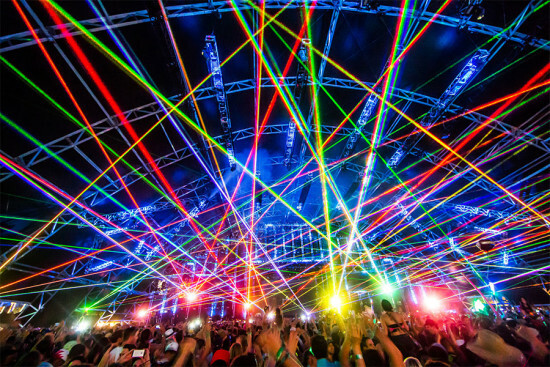 Ever since Woodstock, music festivals have morphed into celebrations of eclectic hedonism and of course, all types of artistic expression. 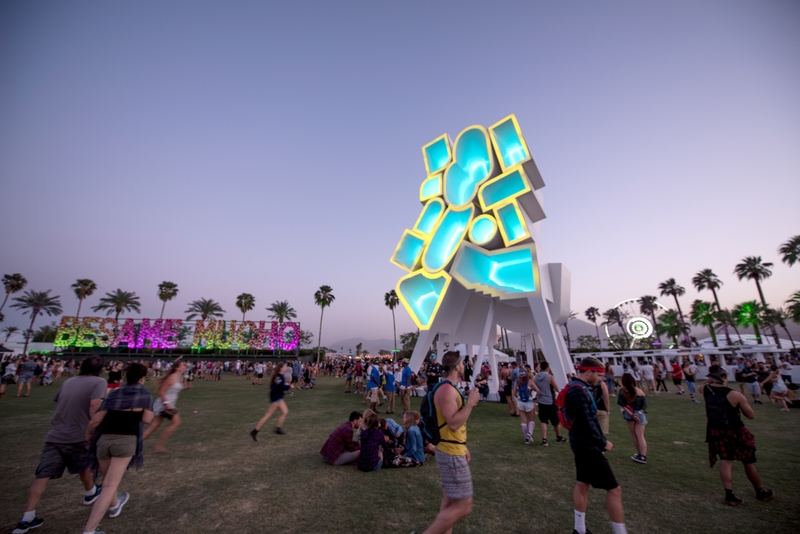 Indio, California's Coachella, which starts tomorrow, is no exception. 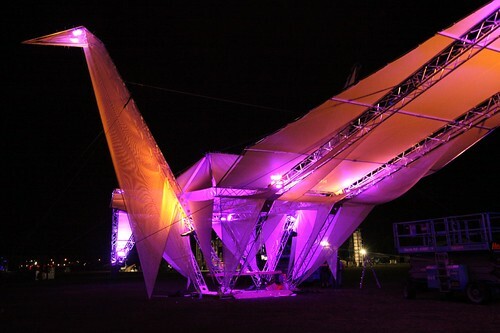 In addition to three days of music, the festival offers dozens of art installations. 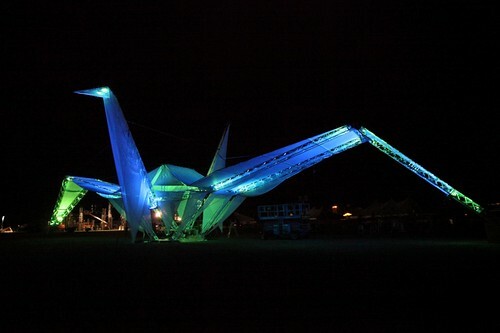 This year the most prominent, right at the festival's entrance, is called Ascension, The Crane. 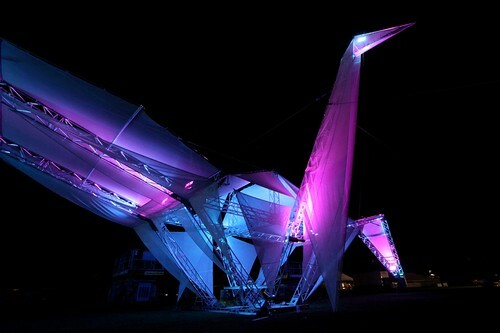 It's just that: a giant white crane made of modular aluminum tubes and a mesh fabric called Textilene. It measures 45-feet-tall with a 150-foot wingspan, and the big bird's multi-colored LED lighting is powered by two adjacent photovoltaic stations that also serve as benches and canopies. 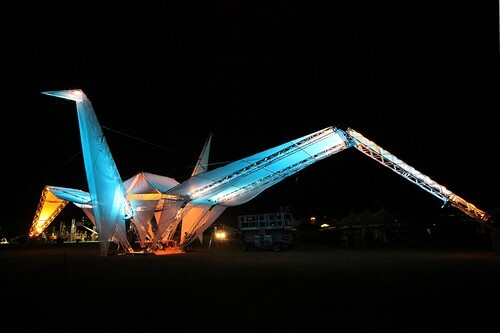 The 35,000 pound crane, which was put together on site (all of its components fit into a single shipping container), was designed by Crimson Collective, a group of socially-oriented designers led by LA visionary Behn Samareh. 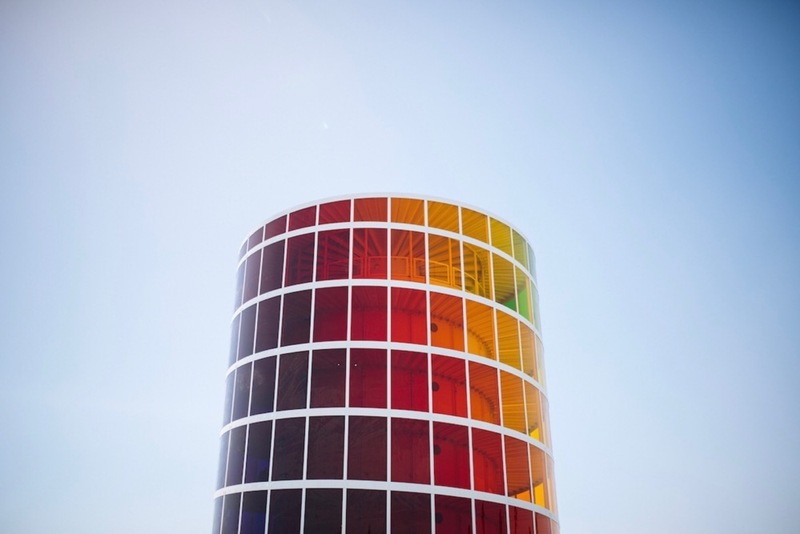 The group works to "bridge the gap between art and architecture," through interactive installations. Check out a fantastic video detailing the construction here. It should be noted that the crane is a symbol of grace, wisdom and peace. This explains why all origami seems to be crane-based, including, apparently, gargantuan origami.